815 backers pledged $90,389 to help bring this project to life. Tower defense that you can share with your friends. This board game adaptation combines all the best elements of tower defense video games with the joy of a customizable social board game. Play solo or with up to 7(+) friends in this unique cooperative game that allows players to drop in and out mid-game. Tack on the immersive strategy, unique features, and a touch of a RPG feel and you've got a game with endless re-playability that will bring fun, thought, and just the right amount of challenge to any game night ...again and again. If you'd like to see the game in action, or want to find out if tower defense can really be captured effectively in the table-top format before you make your pledge, please watch the "how to play" video or the 3rd party reviewer videos, just below. Rahdo's "final thoughts" video speaks particularly well to this. Now that we have fully funded (thank you! ), we have moved the completely backer-chosen Stretch Goals and Add On charts up to the top so that you can find and track what's next in line to come for free with your game, and you might like to add. Recent: The last Level 99 Bonus Card! The extremely O.P. Runika and Udstad Armory Card, FREE in every Kickstarter copy of the game. - ONLY, the Kickstarter copy of the game. Our thanks to YOU for what you have done. Up next: Tons of extra dice! They're not just generic 1 color d20s, they're each designed in the color scheme of the Hero they are intended for! This will complete your set that you've already started with the Add On Heroes! To add the following optional items to your rewards, simply add the value of the items you are interested in to your pledge amount by clicking on the blue "Manage Your Pledge" button at the top of the page. When the project comes to completion, we will contact you to find out which bonus items you chose, and send them out to you around the same time as the game itself. Shipping for all of these items will be handled personally so I can offer you "Flat Rate" shipping on them. Add 1 item, or add all of them, you still only pay the shipping rate once. Please don't forget to add your shipping costs, if any, when managing your pledge. Have fun! What can you do with the Map Expansion Pack? Epic 5x5 super twist maps with intersections, splits, and lane jumping monsters! What if you toss in the Stretch Goal tiles? Here's another more detailed short list of the item tiers you're looking for. TKA Core Game - Base game. Full game for 100% full enjoyable play. TKA Deluxe Game - Includes: bonus Hero Asphar The Barbarian. TKA Super Deluxe - Includes: Asphar and KS exclusive Special Aid. Mega Bundles ($180+/-) - Includes: Deluxe or Super Deluxe, plus Map, Accessory, & Hero Parchments, plus base 9 pewter minis. *New* Everything BUT... - Includes: Map, Accessory, Hero, Early Expansion, & Fairytale Games Parchments, plus Full Color PnP, but... no minis. *New* Everything AND Pewter - Includes: Map, Accessory, Hero, Early Expansion, & Fairytale Games Parchments, plus Full Color PnP, and 9 Pewter minis. Complete - Includes: Map, Accessory, Hero, & Early Expansion Parchments, plus 9 BRONZE minis. Really Really Complete - Includes: Map, Accessory, Hero, Early Expansion, & Fairytale Games Parchments, plus Full Color PnP, and 9 BRONZE minis. *Please see the FAQ section at the very bottom of the page for answers to common Add-On questions..
View the full pledge chart for a graphic representation of the above list. Find what you are looking for quickly by searching for the section code. A short list of Unique Features that have been thoughtfully designed into The King's Armory. Each time you play, all of the following factors will change: the map, played heroes, hired help, equipment, reinforcements, fought monsters, boss monster(s), and the final armory card. Tack on the various scenarios from the manual, and you'll never play the same game twice. *A teaching tool for your kids. The King's Armory is designed for play by adults & teens (13+), but since us adults tend to have children, it has been made safe for play with them. No need to worry about "beating your kids in a board game" or "cheating so you can pretend to lose", parents can use the cooperative play nature of TKA as a tool to instruct children in strategy, spatial relations, and effective team work, while still enjoying the game. *EU & Canada friendly shipping. *A partnership with Level 99 Games. Game play starts once you have built the customizable modular map, which can be altered to your style and difficulty level, and each player has selected his or her starting Hero; with each Hero having their own unique skill set. Each of every 5 (to 7) Waves, the ferocious enemy will send armies of monsters to march across the path in an attempt to reach the castle, smash through the gate, and pillage the King's Armory.. Your team of Heroes, fully under your control, will defend the Armory turn by turn by building Towers from which you will attack the monsters with a wide array of powers and special actions. Between each Wave, your Heroes will return to the safety of the Towers to heal, spend reward gold, and to hire some much needed back-up: the Hirables. All Hireables are fully upgradable, each with their unique powers and bonuses. 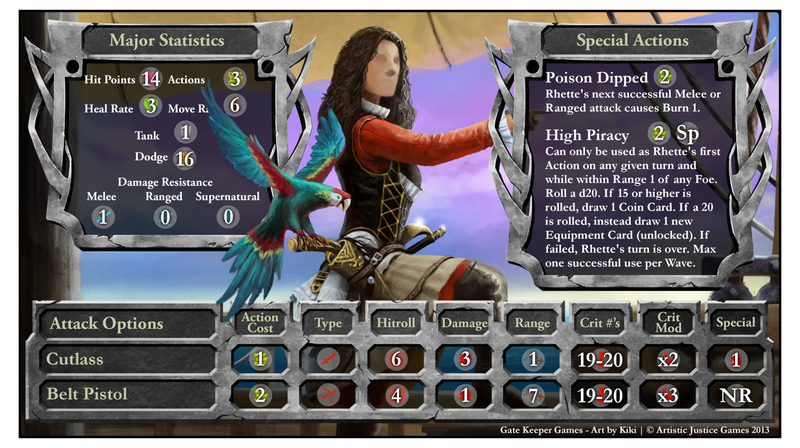 For more detailed information on the Heroes, Hireables, and their abilities click on the images, visit the TKA site here, or download and try the PnP. You may also visit the Armory yourself to buy powerful Equipment that will enhance your Heroes' abilities, and may even grant them new ones. With each success you have, the enemy will grow more and more ferocious and you will need to recruit Reinforcements. With proper implementation of these extremely powerful one-time effects, you can make or break your defense; but use them wisely, as things like comets and lighting tend not to discriminate. For more information on the 4 Card Decks and how they work click on their image or visit the TKA site here. On the last Wave of the game, the Boss Monster will arrive - dripping with power, and often surrounded by additional forces. This is end-game. The Heroes and their Hireables must defeat the enemy and his armies, and can even commission the legendary Armory Card for help. If they are successful: victory is yours! Though, if they fail, the Boss will break through their defense and reach the Armory and unleash its contents against the king. ...yes, the very one who was crazy and eccentric enough to make such a weapon in the first place! ...our favorite, the epic Sword Golem! *Cards are not used rapidly during play as in CCGs, and can affect the entire outcome of a game; they therefore each contain a very useful description of its effects. Read the rules here. Available in English, German, and Spanish. Visit our website for lots of bonus content & character details. Watch the game play video below. Try it for yourself - PnP available in Update #2. ...the master of water and ice, a major damage output Hero, has joined the team for a limited run on Kickstarter. By choosing to add this amazing Hero to your game, you will gain a new character who has the rare ability to deal damage in two types, both Melee and Supernatural, and you will increase your base maximum number of players to 8. Asphar the Barbarian comes with his Hero Stat card (not shown here), 2 new Equipment Cards & 1 specialized Reinforcement Card to be added to their respective decks, and his own water swirl-colored d20, regardless of Stretch Goal outcomes. Backup is KS Exclusive Reinforcement Card in honor of you, our Back-ers, that allows you to resurrect a defeated Hireable, a power otherwise unattainable in the game. Now included in every KS copy of the game as our thanks to you. Special Aid is an extremely powerful, limited edition, Kickstarter Exclusive Reinforcement Card that allows you to summon an unused Hero onto the battlefield for one turn, or allows a single player the opportunity to permanently switch out his Hero for another. Add this card to your Reinforcement deck to increase the power of power it holds. *All "SUPER DELUXE" copies of the game include: Backup, Asphar the Barbarian (with all bonus items), and Special Aid. What that means is: super low shipping costs with Customs & VAT included for all European Union countries, along with Canada; with rules currently available in German and under translation into Spanish. See the chart below for shipping details. We have also striven to provide the best possible shipping rates to the rest of the gaming world. If you have any questions or suggestions, please don't hesitate to contact us. When pledging from any of the non-USA locations below, please add your International Shipping rate listed by area below. Game manual available in English, German, and Spanish here. Click here for full details and access to the footnotes regarding customs, VAT, and GST. Reduced rates for Add-Ons available if adding them to all 4 or 10 copies. Contact us for details. What are the pros saying...? -"This game completely supports scaling [drop in, drop out] mid game... That is awesome! Why doesn't every game do that!?" -"The amount of variety this game provides... I mean... it's second to none." -"The King's Armory, really really great, I just can't rave about it enough!" Watch Rahdo's full video review here. Jump right to Rahdo's "Final thoughts on the game" summary video here. Rahdo's Update Video just because he loves this game, here. -"This game has been a heck of a lot of fun for my group and I to play." -"I've played the game 8 times... it's a really really good game." -"When I actually stop and high five somebody, I can tell I'm into the game and I can tell I'm enjoying the heck out of it. The game's a winner at that point. ...I can't speak highly enough about it." Watch Undead Viking's full video review here. Jump right to the gameplay section here. Jump right to the "what I thought about the game" section here. -"My honest opinion... ...I really think it's a good game..."
-"...it works with any number of players; solo, 5; 7..."
-"...the characters are all really different..."
-"The bad thing about the game: That I only had a prototype!" Watch Board Game Brawl's full video review here. -"I [gave] it a shot at GenCon... What really intrigued me was the list of key features: 1 to 7 players, variable game length, and --most interesting-- the ability to have players drop it and out as needed." ~Geek Dad - blog and community site by dads for dads. ~Read our Q&A article with writer Jonathan H. Liu here. "We are very happy to know you're making a tower defense board game! And we are honored to have you inspired with Kingdom Rush :)"
~Ironhide Game Studio - makers of TD legend: "Kingdom Rush"
"Played the Print and Play... Really fun tower defense board game... 9.5"
"...[the] very flexible way to fit the rules to the preferred level of game difficulty gives The King's Armory a lot of deep gameplay and replayability... 9.0"
"We learned to play in less than 10 minutes... It's amazing, it's an awesome game!" Find other comments and ratings here on BoardGameGeek.com. Or view video comments here, here, and here. We are pleased to announce that we have partnered with the incredible people at Level 99 Games to bring you BattleCON Devastation of Indines characters & features as incredibly rare limited edition bonuses to the Kickstarter edition of The King's Armory. We have also recently partnered with Artistic Justice Games! The great folks that brought you Fairytale Games and the related miniatures line. You'll find them both in the Gamer Achievements and Add Ons charts at the very top of this page. Yes. That means your favorite BattleCON AND Fairytale Games Characters just became TKA Playable Heroes! Further, as all TKA Heroes have personalized Equipment and Reinforcement Cards, your new BattleCON & Fairytale Games Heroes each come with their signature Equipment and a powerful Reinforcement Card! Early-Bird Discount: These limited tiers are a promise and a thank you to previous backers. We've added enough for a few new visitors to jump on board as well! Our Motto: "This is your game!" We've incorporated every bit of our backers', and even our non-backers' (thank you BGG forums), feedback (to the extent that it did not affect balance or upset game play). You have named characters, voted for art, and even chose our funding goal. Now it's time to take it home. Kickstarter Exclusive Bonuses: You come first, and therefore get all the perks of backing on KS: $20 off of retail, super cheap shipping, KS Exclusives in every pledge level, KS Exclusives all over the Gamer Achievement list, Limited Edition content, stretch goal bonuses, extremely unique partnerships, and our promise to integrity. We will always be completely honest and transparent with you. Because We Need You: We've covered the cost for much of the art, used IndieGoGo for the rest of the heroes, and gladly pour countless hours into ensuring that your game is as quality as it can be, but we can't manufacture and ship the game without your support. Founded by John and Anne Wrot!, Gate Keeper Games exists to actualize epic game ideas and bring people together under the banner of Family. We strive to make each game fun, balanced, and community-building. We love to bring friends together, and we see board games as a wonderful way to bring both friends and friends-to-be around the table for creative and entertaining good times. Located in Southern California with friends and family on every continent (yes, even Antarctica), we have a passion for making games that foster unity wherever you may be. With a commitment to treating our backers like family, you can be assured of a high quality game, with high quality components, and a money back guarantee (see FAQs for details). Visiting our facebook at: FB - 'Like' it for bonus content via the FB feed. And above all, thank you for viewing our project page. The two most common risks for game publishers are, of course, delays in production and/or shipping. Regarding production delays, we have worked extensively with our manufacturers to establish valuable and respectable relationships and production expectations. We value you like family - so you can expect that we will fight to get you your goods on time. Whether on time, or if there delays, will keep you as updated we would like to be. The second most common problem, shipping issues, is a tough one. There's always the risk of pirates, ahem-Rhette-ahem-possible-SG-Hero-ahem, the occasional attack by the leviathan, or, of course, a 'Perfect Storm'. Against these we can only pray. Beyond that, the majority of the shipping will be handled by the ever-competent Amazon Fulfillment, and the rest by ourselves. So, you're in good hands. Come pirates or high water, we'll do everything we can to get you your games and bonus items. We have researched both of these issues extensively, and can give you our word that we'll work as hard as we can to be people of integrity with your funds, your expectations, and your trust. GOLD COINS - For your donation of 1 Gold Coin we offer you our thanks, immediate access to the basic PnP (Print n' Play) in PDF form (found in Backer-Only update #2), and welcome you to join us in the comments. FULL COLOR PnP - You will receive the Full Color PnP, which will include all printable "Gamer Achievements" that are unlocked. Add all printable "Add Ons" for $5. A great option for backers that are excited but find higher costs prohibitive at this time. *EARLY BIRD* - TKA CORE GAME - You will receive one copy of the TKA Core Game, so you can trash those monsters as they rightfully deserve! Includes *KS Exclusive* "Backup" Reinforcement Card - Includes all Unlocked Gamer Achievements - International backers, please consult the shipping guide to the left and add your country's shipping rate to your pledge. TKA CORE GAME - You will receive one copy of the TKA Core Game (at over $20 off MSRP), so you can trash those monsters as they rightfully deserve! Includes *KS Exclusive* "Backup" Reinforcement Card - Includes all Unlocked Gamer Achievements - International backers, please consult the shipping guide to the left and add your country's shipping rate to your pledge. TKA DELUXE - HERO UPGRADE! - Includes everything in the TKA CORE GAME Level PLUS we will add Asphar the Barbarian to your game. A serious Damage output Hero with the ability to deal damage as either Melee or Supernatural. This is a *Kickstarter Exclusive* Bonus only available by pledging via Kickstarter! ~ He comes with ALL of the following: His Hero Stat Card, his own blue d20, his own specialized Reinforcement Card to add to your Reinforcement Deck, AND TWO new Equipment Cards (see description to the left for details). (Add $10 to any higher pledge level to add Asphar and his bonuses.) - International backers, please consult the shipping guide to the left and add your country's shipping rate to your pledge. EARLY BIRD - TKA SUPER DELUXE - "SPECIAL AID" - Includes the DELUXE version of the game PLUS the unique limited edition "Special Aid" Reinforcement Card! It should be noted that: "Special Aid" is *ONLY* available through this Kickstarter Backing and in limited numbers. - International backers, please consult the shipping guide to the left and add your country's shipping rate to your pledge. TKA SUPER DELUXE - "SPECIAL AID" - Includes the DELUXE version of the game PLUS the unique limited edition "Special Aid" Reinforcement Card! It should be noted that: "Special Aid" is *ONLY* available through this Kickstarter Backing and in limited numbers. - International backers, please consult the shipping guide to the left and add your country's shipping rate to your pledge. EARLY BIRD - TKA "SUPER DELUXE" MEGA BUNDLE- This package deal includes the TKA SUPER DELUXE "Special Aid" Level, and all of the following Add Ons: 2 4-way Tiles, 3 Switcher Tiles, Map Expansion Pack, Special Wave die, Sorting Bags, BBSSB Tokens, Epoch the Ninja, Alexian the War King, and the Base set of 7 Minis, along with Asphar & Zoe's minis. - Save $15 - You will also receive Silver Supporter credit on our Website and in the game manual. - (does not include bronze minis) - International shipping rates, including Flat Rate Add-On Shipping, apply; please consult the shipping guide, and Add On Charts, to the left and add your country's shipping rate to your pledge. TKA MEGA BUNDLE - This package deal includes the TKA DELUXE "Hero Upgrade" Level and all of the following Add Ons: 2 4-way Tiles, 3 Switcher Tiles, Map Expansion Pack, Special Wave die, Sorting Bags, BBSSB Tokens, Epoch the Ninja, Alexian the War King, and the Base set of 7 Minis, along with Asphar & Zoe's minis. - Save $10 - You will also receive Silver Supporter credit on our Website and in the game manual. - (does not include bronze minis) - International shipping rates, including Flat Rate Add-On Shipping, apply; please consult the shipping guide, and Add On Charts, to the left and add your country's shipping rate to your pledge. TKA "SUPER DELUXE" MEGA BUNDLE- This package deal includes the TKA SUPER DELUXE "Special Aid" Level, and all of the following Add Ons: 2 4-way Tiles, 3 Switcher Tiles, Map Expansion Pack, Special Wave die, Sorting Bags, BBSSB Tokens, Epoch the Ninja, Alexian the War King, and the Base set of 7 Minis, along with Asphar & Zoe's minis. - Save $10 - You will also receive Silver Supporter credit on our Website and in the game manual. - (does not include bronze minis) - International shipping rates, including Flat Rate Add-On Shipping, apply; please consult the shipping guide, and Add On Charts, to the left and add your country's shipping rates to your pledge. “EVERYTHING …but… MINIS” - This pledge level includes the TKA SUPER DELUXE "Special Aid" Level, and every Add On except for miniatures and extra physical copies of the game. - Save $20 off MSRP, plus $18 over pledging for everything separately - You will also receive Gold Supporter credit on our Website and in the game manual. - International shipping rates, including Flat Rate Add-On Shipping, apply; please consult the shipping guide, and Add On Charts, to the left and add your country's shipping rates to your pledge. BULK & RETAILER TIER - To the left in the Shipping Section you'll find the Bulk Pledge Level Charts; 1 for Retailers, and 1 for all Backers. Choose your pledge amount, and select this Tier when placing your pledge. All shipping is included in listed rates. *Retailer status must be verified to obtain the Retailer Pledge Rates. “EVERYTHING …AND… PEWTER MINIS” - This pledge level includes the TKA SUPER DELUXE "Special Aid" Level, and every Add On including the first 9 pewter minis (Base set, plus Asphar & Zoe). - Does not include extra physical copies of the game. - Save $20 off MSRP, plus $28 over pledging for everything separately - You will also receive Gold Supporter credit on our Website and in the game manual. - International shipping rates, including Flat Rate Add-On Shipping, apply; please consult the shipping guide, and Add On Charts, to the left and add your country's shipping rates to your pledge. BOSS MONSTER - We will turn your likeness into one of our super rare Boss Monsters. (Only 7 in the base game!) - Note: the Goblin Golem to the left - Also includes the TKA SUPER DELUXE version of the Game. - You will also receive PLATINUM Supporter credit in the game manual. - Shipping Included. EARLY BIRD - TKA "COMPLETE” BUNDLE - This top tier package includes the TKA SUPER DELUXE "Special Aid" Level, and every Add On item ever listed on any of the following Add On Parchments: the “Map Add Ons”, the “Accessory Add Ons”, the “New Hero Add Ons”, the “Early Expansion Add Ons”, AND any 9 BRONZE MINIATURES of your choice. - Save over $55 vs. pledging for each item individually, and $20 off of MSRP; PLUS, any applicable “Add On Flat Rate Shipping” charges are also on us. - Supporters at this level may add additional Bronze Minis for only $20 each, no limit. - You will also receive Gold Supporter credit on our Website and in the game manual. - Basic international shipping rates do apply; please consult the shipping guide to the left and add your country's shipping rate to your pledge. TKA “REALLY REALLY COMPLETE” BUNDLE - This tier includes the Super Deluxe “Special Aid” version of the game and everything from the first 5 Add On Charts (Map, Accessory, New Hero, Early Expansion, & the brand new ‘Fairytale Games’ addition), PLUS any 9 Bronze Minis of your choice. Supporters at this level may add additional Bronze Minis for only $20 each, no limit. You’ll save a full $50+ by pledging at this level. Basic international shipping rates do apply; please consult the shipping guide to the left and add your country’s shipping rate to your pledge. "KEEPER OF THE GATE!" - This pledge level includes the entire “Really Really Complete” Level AND we will make you into a fully playable Hero AND cast you as a Bronze Miniature! - Yeah! - It’ll be glorious! - You will also receive "Keeper of the Gate" Supporter credit in the manual and on our website. - Naturally, we'll cover all shipping. - And, you’ll gain the right to forever spell your name with an Exclamation Point! ...I mean, that's just Awesome!